For those paying taxes and other government dues, it is a double whammy. Most often the collection is as much on `Client’ (government) as on `Own’ (staff) account. To tackle this, the government should drastically reduce, if not remove, taxes and regulations, shrink itself and encourage private initiative. The pushcart vendor and the self-employed must be allowed to live in peace and with honour and dignity. GOVERNMENT employees collect taxes on “Client Account,” that is, for the government, and on their “Own Account.” So much so that often, rather than supplement the official income, the “Own Account” collections exceed it. The collection on the “Client Account” can be done only by employees in tax-related (like direct and indirect taxes) departments but on “Own Account” can be done by any employee or his agent for any human endeavour of any citizen for inaction, speed, or by inducement, lure, threat or intimidation. It is to be noted that without political patronage “Own Account” taxes cannot exist. The government employees collect “Own Account” taxes from citizens on many counts some of which are presented in Table 1. From the Table, it is clear that the “Own Account” tax collection is birth-to-death levy, and, more important, is no longer considered improper. An informal survey was done over the last two years in different parts of a city to get an idea of the type of “Own Account” transactions and to estimate the amount changing hands. This coupled with various news reports about graft cases/Lok Ayukta reports published in newspapers were used to estimates of “Own Account” deals. This deals mainly with non-corporate (proprietorship/partnership) users and individuals. Large amount of “Own Account” transaction on major/minor projects both at the State and at the Central level are not covered by this. Also it should be noted that every “Own Account” tax does not have a corresponding “Client Account” (government) taxes. As already noted, only employees in tax collection/revenue, or regulatory departments can collect “Client Account” taxes, with receipts. 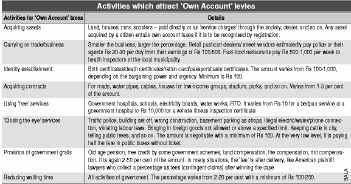 Simultaneously, staff of these departments also collect “Own Account” levies that often also reduce the flow of the former. In one locality there were nearly 1000 petty businesses — mainly temporary shops and roadside vendors. Each was paying “agents” Rs 10 to Rs 50 daily (depending on their size) either in cash or kind. This would not be possible without the knowledge and connivance of the local political leaders and even the police (it falls under second category in the chart). The `payment’ averages Rs 20,000 to Rs 40,000 every day. From the nearly 50 such small and big locations across the city, the collection adds up to Rs 10 lakh to Rs 20 lakh per day. It is estimated that for all categories, the revenue generated in one city on “Own Account” could be around Rs 100 lakh a day. This city is not even a metro. And, this is only for those nodal points not directly involved in collecting “Client Account” (government) taxes. Based on an average of 250 days of government activity, the annual `collection’ in one city alone would be around Rs 250 crore. Even this is an under-estimate as “Own Account” collections under category two (carrying on trade business) can be for 300 days since roadside vendors do not have holidays. At the national level of, say, 100 cities/towns it adds up to a whopping Rs 25,000 crore. According to the Economic Survey 2003-04, the combined tax receipts of the Central and State governments in 2001-02 was Rs 313,974 crore (Page 41, Table 2.11). If we use the thumb rule that the taxes were under-collected up to 30 per cent, then the actual taxes would have been Rs 448, 534 crore. The difference of Rs 134,560 crore arises out of “Own Account” reasons. Of this even if 25 per cent is collected as “Own Account” (tax saved by the payer is 75 per cent of this), the amount would be Rs 33,640 crore. Putting these two together we get an estimate of Rs 58,640 crore or, say, Rs 60,000 crore, as the consolidated ” Own Account” collections. According to National Accounts Statistics, the total GDP was Rs 21 lakh crore in 2001-02, which means the Rs 60,000 crore constitutes around 3 per cent of GDP. The aggregate taxes were 15 per cent of GDP, as seen earlier. This implies that “Own Account” taxes constitute at least one-fifth of “Client Taxes,” or those received by the government. This is without taking into account the huge corporate transactions on contracts worth billions of rupees on airports, expressways, power plants, IT parks, Defence purchases etc. If we add them all, the “Own Account” collections would be at least 6 per cent of GDP constituting one-third of the taxes received by the client — the government. This is one reason why a large number of posts in various government departments, particularly at the State level, are apparently auctioned to the highest bidder. It is no secret that in Police Department in many States “critical” location postings need substantial payments as also in sales tax, land registration, and such other departments. Needless to add, this “Own Account” collections are done with the connivance and/or encouragement of the political leaders who get a large share of this. The important issue is the usage to which the “Own Account” taxes are put. A substantial portion of the unorganised credit market is serviced by “Own Account” taxes, and the police said to be fast emerging the major credit providers/collectors in the unorganised market. This has far-reaching implications for civil society and credit markets. More important at the current juncture, is the clamour for the Employment Guarantee Act (EGA) and the enthusiasm shown by the Left economists and intellectuals for a large outlay on this score. It could be as low as Rs 10,000 crore or as high as Rs 1 lakh crore, depending upon the final Bill to be passed in Parliament. But the important issue not addressed by the Left economists is of “Own Account” taxes such a scheme will generate. It will only enlarge the taxes levied by government employees and that will throw up larger social issues. In tackling poverty and unemployment, it must be remembered that the government is not the solution but it is the problem. Hence, the government should drastically reduce or remove taxes and regulations and encourage philanthropy for productive purposes. As the recent tsunami disaster relief reveals, the initiative could be left to social service organisations such as the Ramakrishna Mission or AIM for SEVA which would be able to identify the target group much better. The “Social Capital” in the form of community and family efforts could go a long way in ameliorating problems of unemployment rather than the government taxing its citizens and spending on it since on both counts there will be huge “Own Account” collections by its employees. The best way the government can generate more employment is by shrinking itself and encouraging private initiative and allowing the pushcart vendor and the self-employed trader to live in peace and with honour and dignity.